So I love me some snowflake manis and am always so happy to use the image plates from Nailart and Mehr I bought last year for the holidays. The only flaw is that there are so many images it's a challenge to use them all before the season is over. Orly Winter Wonderland has been sitting in my untrieds since last year. 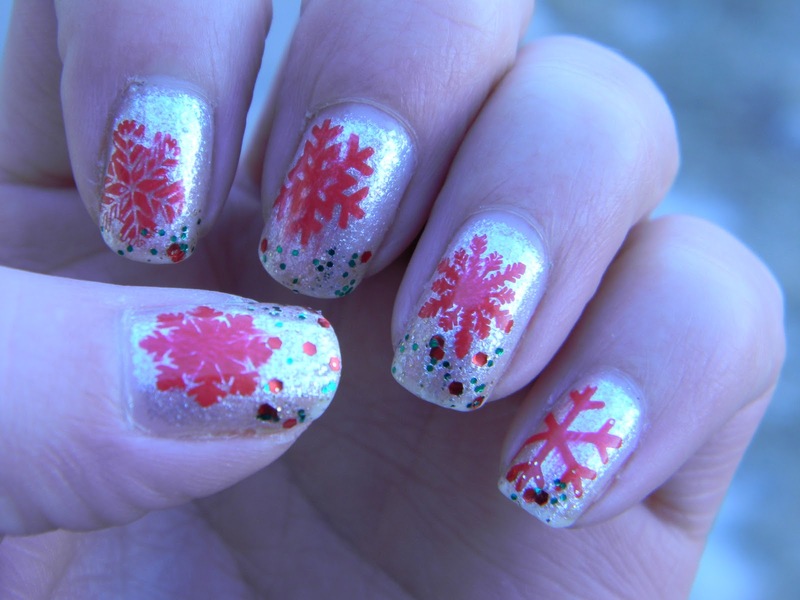 What a perfect base - this is three coats of Winter Wonderland with five of the seven images from plate 011. I also wanted to do something different than the standard blue or white which led me to red. I used China Glaze's bright red cream Hey Sailor to stamp and added my favorite holiday glitter, China Glaze Party Hearty, on just the tips. It's the countdown to Christmas and a nice week off work yippie! Are you getting excited? This is cute. Yes congrats on theweek off of work. Ehh just finished finals! I shall now have time to do Xmas nails nd blog!